If you are looking to find exotic additions to your inventory, our selection of candle lanterns, tea light holders, and votives are sure to please those customers looking for extraordinary styles. Whether they are looking to find the perfect gift or simply browsing for an ornament to add to their home, our collection offers unique options that are inspired by different cultures. Including everything from beautiful lotus-shaped tea light holders in a multitude of colors to paper and wood lanterns representing various themes, we travel far and wide to find undiscovered appealing products to fill your shelves. Shop a wide assortment of candle lanterns from World Buyers today! Mercury glass candle holders in Victorian rose, violet and moss colors. Clearance price show nearly 60% off. Floral pattern lantern with rich gold finish. Gold and sage metal candle holder. Lovely Sage and gold metal lantern. Perfect for candles or even a bouquet if you place a jar or small vase inside! Lovely round metal lantern dark gold metal with sage accent color. Lovely white and silver metal lantern. Perfect for candles or even a bouquet if you place a jar or small vase inside! Floral pattern gold and ecru metal lantern. Antique style metal lantern. Floral pattern with a moss accent color. Gold and sage metal lantern with unique chain link handle! Elegant gold and ecru metal lantern. Punch cut design metal lantern with handle. Order in increments of 3. Lovely metal lantern in gold with medallion pattern. Vintage jewelry holder uses natural shape of twig accented with little bird. This little guy is allowed on the table! Imagine several gracing your tablescape. Clearance price shown now 50% off! Blue ceramic flower tealight holder. 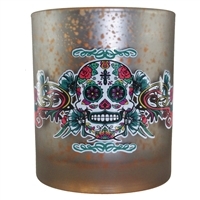 Silver Mercury glass candle holder with colorful sugar skull design. 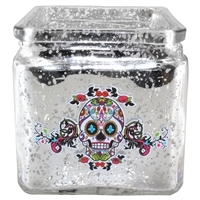 Day of the Dead aqua mercury glass candle votives. Three colorful sugar skull designs in this assortment! Click image to see them illuminated by tealight! Coal and copper mercury glass candle holder with unique sugar skull design! Perfect for table lighting or try a small bouquet! A smaller lantern perfect for votive OR small plant on table. Antique black finish. Product Dimensions: 3.5 X 3.5 X 4" Clearance price shown now 50% off! Lucine Gold on Gray Metal Lantern. Price shown now 50% off! Mercury glass votives wrapped in filigre metal. Vibrant jewel colors in peridot, blue topaz and pink tourmaline. Clearance price shown now 50% off! Punch cut diamond pattern with slight sage undertone. Vintage style black and gold finish. Opening is 2.75" dia. Handle height is 3.75"